New search tool offers rich analysis include citations and panelist statistics. A panelist snapshot on UDRP.tools. A trio of domain name experts has launched UDRP.tools, a new search and analysis tool for cybersquatting cases heard under the Uniform Domain Name Dispute Resolution Policy (UDRP). There are some other good UDRP search tools out there, but UDRP.tools provides unprecedented data views that will be particularly helpful to attorneys. For example, you can see case citations and how individual panelists have decided cases. Three domain name industry veterans teamed up to create the system. Kevin Ohashi of web host comparison site ReviewSignal and Michael Sumner of domain sales data site NameBio developed the site with the assistance of Nat Cohen. Let’s say you are defending a three-letter dot-com domain. You can not only pull up all LLL.com cases, you can also filter for ones where RDNH was found to mount the strongest possible defense. With the Citations Report you can see which cases those winners cited most frequently, basically giving you the playbook for how they won. 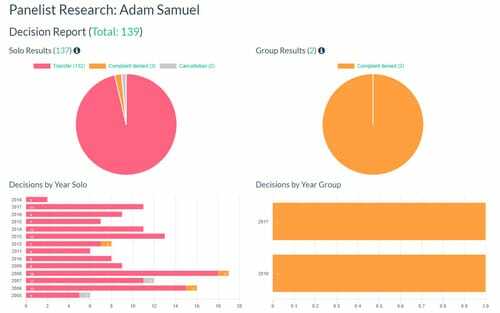 But now you need to nominate one of hundreds of panelists to your three-member panel, with the Outcomes Report you can easily see who is most likely to find in your favor based on their past decisions in LLL.com cases. UDRP.tools includes all cases decided by World Intellectual Property Organization (WIPO), National Arbitration Forum and Czech Arbitration Court. It’s free to use on a limited basis. Registration is required after five searches in any given day and registration includes 50 non-expiring search credits. Additional credits are available for a fee. Kudos to the team for the heraclean task of classifying 60k+ cases with unique identifiers and creating a database that can be perused via filters. The project will be useful for lawyers and litigators researching similar cases. Very nice to see more sites that gives stats on domain name industry. I compared few filters with https://www.dndisputes.com/ seems the results differ, I’m not sure how both sites are pulling their data and are they licensed by arbitration centers or regular web scrapping? I believe DNDisputes only pulls from WIPO. What a generous gift to the industry — thank you, Kevin, Michael, and Nat! I hope that they add to the information details of Court Judgements whereby either Complainants OR Respondents have gone on to overturn the original UDRP decisions. More and more are going that way. Thanks guys. This a very helpful tool for domain investors, and the domain field in general.